Nursing Sister, CSR, Lautoka and Ba. By R A B (Tony) Snowsill. Ed. Tom Buckle (Jean’s son). Jean Brandon Buckle was my aunt, my father’s sister. My father was the late Mr Alan (Soot) Snowsill, who died in June 1970. Jean grew up in the small town of Nausori, Fiji, which is some 25 klm from Suva, the capital of Fiji. The town is situated on the Rewa River. Jean was born in Nausori in 1914. Jean, like her mother, Jessie Minnie Alice Snowsill (nee Shave) loved and respected the Rewa River. The Rewa River is the confluence of several Rivers which drain the mountainous highlands of Viti Levu, Fiji’s largest island. Jean’s father was Sydney Herbert Brandon Snowsill. Her nephew was Sydney Brandon Snowsill. To know Jean one must know her background. Jean’s mother, our grandmother, Jessie, was born in Navutoka in 1882, near Vunidawa, in the far upper reaches of the Wainimala River. This river is one of the tributaries to the Rewa River. Can you imagine what life was like in those days in such a remote place? Daily life was a trial which we could not imagine. As a youngster Jessie and her family had, at times, to hide in caves when Fijian Tribes were at war with each other. Jessie’s father was a planter. He tried growing, onions, potatoes and cotton all of which failed as the area was too humid and had too high a rainfall. He later tried horse rising and then he became a farm manager for others in the area. Jessie’s father died when she was very young and she was brought up by the Koster Family who operated a huge estate in the vicinity. The Koster’s found some success at horse, cattle and sheep rising after their crop and spice growing trials also failed. could deal with any local problem. She could advise on removing rust or mildew from fabric, on ridding a house of ants, silverfish, hornets and bees. She was more experienced than a recently arrived medico in dealing with childhood ailments: prickly-heat, hives, teething problems, ringworm, boils, splinters, ear-ache and thrush. She would provide recipes for native vegetables and fruit, advise on the specific firewood required for baking cakes, and explain the adjustments necessary for a wood-stove damper. Typical horticulture and tension difficulties in a treadle sewing machine also fell within her range. Aunty Jean developed a caring nature as a child. Aunty Jean would sit beside my father when he first went to the CSR School to translate what the teacher was telling him. This was because my father had, to a significant extent, been brought up by an Indian ‘Di’ (nurse/babysitter) all his young life and only spoke Hindustani (Hindi) at that time. This was not unusual, as many CSR children grew up to be first fluent in Hindi, then later in Fijian and English. Children were “seen and not heard”. Jean had mastered several dialects of these diverse languages. Being the caring and compassionate person she was Aunty Jean decided she would like to be a nurse and went to nursing college first in Suva at the CWM, and later to New Plymouth, in New Zealand. Coincidentally, many years later, I later went to boarding school in New Plymouth. Upon her return to Fiji she worked for the CSR as their nursing sister in their dispensaries based in Lautoka and later in Ba and in the Ba Cottage and Lautoka Hospitals. In Lautoka she met a young engineer, Mr Stan Buckle, who worked for “the company”, and they married. CWM photos courtesy of Just Pacific website by Rod Ewins. Jean was well known as a most efficient and effective nursing Sister in Lautoka and Ba. Her nursing skills were of the highest order and these coupled with her knowledge of the local languages made her a most valuable staff member for the CSR Company. The mill in those days employed up to 500 people when the mill was “crushing”. She nursed many company personnel back to health in a time when today’s medicines were not invented and superior nursing techniques was the difference between life and death. all depending on the rains at the headwaters of the numerous smaller rivers which fed the Rewa River. The river was used to transport all manner of produce and livestock down to Nausori to the markets there. The river was also navigable from the ocean to the town. Jeans mother, Jessie, taught her daughter all about the river, and together their great love for the River developed. This same love and respect developed for the many people who lived beside the river. To many the Rewa River has an almost spiritual feeling about it. There is always a cooling breeze on the river and being on the river lifts ones spirit….it often looks quiet and slow flowing but it has great power and dangerous currents. This River gets into your being, your “self”, into your blood so to speak, not only because one’s daily life was so dependent upon the river. In Fiji the Fijians speak of their MANA, their spirit, being part of their “self”, and in these times Jean, like her, mother, Jessie, would have developed her own MANA and part of it involved the Rewa River of her childhood. Aunty Jean grew to be a caring, compassionate, considerate and courteous woman. She had a determination about her and wanted to accomplish and do well; she had a certain confidence about her which inspired her friends and work colleagues to achieve, and to be enthusiastic about their goals and particularly their nursing. Aunty Jean was strong and resilient when needs be and gentle and generous as circumstances necessitated. As a nurse Aunty Jean demanded order, cleanliness and insisted upon the determination to succeed of herself and work colleagues. She displayed self-discipline and purposefulness in all she did and achieved. She was patient and tolerant demonstrating understanding and she persevered with all she did. She always responded with humility and modesty when her professional achievements were mentioned. Jean is in the centre with my mother, Shirley, on left and Sister Buxton on right. Written on the photo is; Night staff of CWM on our way to bed. Before Jean’s mother, Jessie Snowsill, died Jessie asked that her ashes be scattered over the Rewa River. And they were … Several baskets of Hibiscus were gathered and Aunty Jean and Uncle Stan and my mother, Shirley, scattered Nana’s (Jessie’s), ashes on this great river, from the Rewa River bridge, sometime after grandmother’s death. My mother said it was a very moving experience. Jean has asked that her own ashes also be scattered upon the Rewa River; the River beside which she was born and raised; the River that meant so much to her and her mother and perhaps they will be together again in spirit. Fiji gained much from Jean Buckle’s hard work, dedicated attention to her chosen profession, and, in general, her skills as a nurse and her being a compassionate, generous human being. Her family has benefited from her ability to nurture and develop her children and her grandchildren. In life if one strives to do ones best for society as a human being , as a Christian, one could do well to look upon the contribution of Jean Buckle and take note how this can be achieved. In celebrating the life of Jean Buckle, it is the joy of life we celebrate. Jean’s life! We celebrate the joys and achievements of her life. Jean’s contribution to our society is celebrated. We celebrate because we are image-bearers of the Creator and we are called to be creative. We celebrate the freedom we have in our beliefs. We celebrate the joy of life which comes from living within the community of our deity. We celebrate the good works God has done in our midst often working through us. So while we mourn Jean’s death we must also celebrate her life, her joys, her creativity and her contribution to our society. I would suggest that you drive from Nausori up to Sawani – where the Adi Cakaubau Girls School is – and then and then drive on to Sareia and then to Vunidawa up the Wainimala. This is where we think the “Navutoka” area is where our Grandmother lived and indeed was born. I hesitate to suggest that this is wild and possible unsafe as far as naive people from Aussie are concerned – I would not take my family up there without an experienced Fijian speaking guide. The road follows the river – most of the way to Vunidawa – my Dad built the original road. But you might be able to find some Fijians in Nausori who know exactly where Navutoka is – but it is in the language of old Fijian so I don’t like your chances – I would call at the “District Officers” office or the Police station at NAUSORI and seek advice about all these matters – report to the police that you are going to wherever – ask them about NAVUTOKA – spelling might have changed – or the name lost because of the place or plantations small size. I would really appreciate any electronic photos of the area you could send me. My, paternal grandmother, Jessie Shave, daughter of a coloniser “planter”, was born in 1882 at Na Vunidala (probably Vunidawa) on the remote upper reaches of the Waimanu River, in southern Viti Levu. After the death of her father Henry, her mother, Minnie Martha Jane Shave, ran a small trading store near Vunidawa, on the Waimanu River. We cannot conceive how difficult life was in that place in the 1880s and particularly for a widow, but it says something for the kindness and tolerance of Fijian society. The area receives roughly 250 inches of rain per year with humidity rarely below ninety percent. When proceeding on foot, horse and bamboo raft, one would have to contend with numerous fords over stony river shallows. Fijian villagers gave protection and one occasion is specifically recorded of the family being called to take refuge with them during an inter-tribal war. Minnie Shave collected her children and packed valuables including her prized sewing machine, which the villagers patiently carried back to the village inside an extremely heavy trunk. Coincidentally, in the 1950s my father, Alan (Soot) Snowsill, was responsible for the oversight of much of the construction and maintenance of the road to Vunidawa and I travelled that road several times as a child, not knowing of our family association with it. The photo below is from 1904 wherein my grandmother – Jessie Minnie Shave is featured. It was given to me by Briar Koster a granddaughter of the Koster shown. The Kosters took in/adopted my grandmother when her mother died. Her father had died some time before that. Jessie Shave became Mrs Sydney Snowsill when she married my grandfather so the written details are somewhat incorrect. Either way I thought you might be able to identify someone in the photo. How interesting is it that our families have been friends since before 1900 – Carl Koster and G Stork signed Jessie Snowsill (nee Shave’s) – then Mrs Sidney Snowsill – marriage certificate as witnesses. After her father’s plantation failed Jessie Shave’s father worked on Karl Koster’s farm as a Plantation Manager at Navutoka on the Wainimala I think it was. A very good article Tony. She was the CSR Co Ltd Dispensary Sister when I was a young boy, about 17 years old From memory, she was very kind and helpful. I think Bob Burgess was the Company’s Pharmacist at that time. Stan was second engineer with CSR when I worked in the CSR store, as no 3 storekeeper. I was never happy with Stan he seemed to be sour towards us young guys. I was reading your posting on Mike Goslings site about Jean Snowsill and noted a photograph of three nurses. I believe you may have mistaken my mother, Elesta McPherson née Hulek for your mother (sic Aunt) . 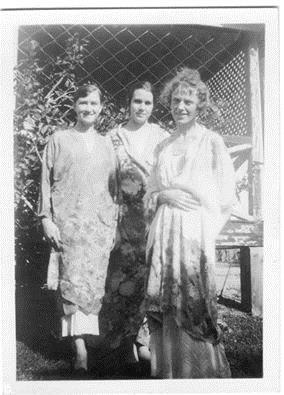 The lady on the left is Elesta, Jean in the centre and sister Buxton is on the left. I emailed this photo to Bruce or you a few years ago. I have a couple of a other photos with Jean in them if you are interested. I will dig them out and send them to you. I only read this posting as I had just seen Mike’s posting in the Faddy family. I commented on the fact that I had found a letter signed by a lady with the surname Faddy to my mother that has created a some confusion as to who this lady was.